The 32 Observations series continues with Nathan Jahnke, PFF’s Director of Analytics, finding an interesting piece of information about all 32 teams after six weeks of football. If you would like to make some observations of your own, you can do so with PFF Elite, where you can find several signature statistics for every offensive and defensive position in football, thanks to Premium Stats 2.0. Buffalo Bills: Jerry Hughes is the only edge defender with a pressure percentage above 20% this season. He is currently at a 21.8% pressure rate. Miami Dolphins: This past week, running back Frank Gore forced three missed tackles on his carries, bringing his total to 352 since 2006. That is currently fourth-most, and he only needs one to tie and two to pass Jonathan Stewart for third on the list. Marshawn Lynch has the most at 595 followed by Adrian Peterson at 464. New England Patriots: The Patriots are the only team with two edge defenders with a pressure percentage above 16.0%. Adrian Clayborn has the fifth-best rate for edge defenders at 16.5%, and Trey Flowers is seventh at 16.0%. New York Jets: Wide receiver Quincy Enunwa has 110 yards after the catch on wide receiver screens, which is 25 more than any other wide receiver. Baltimore Ravens: 50.0% of John Brown‘s targets have come on deep passes (passes of 20-plus yards in the air). If he maintains that for the rest of the season, he would be the second wide receiver with 40+ targets since 2006 with 50% of his targets coming from deep passes. Cincinnati Bengals: When wide receiver A.J. 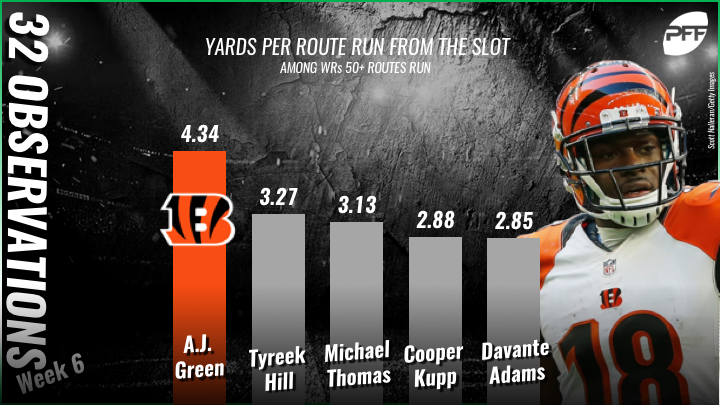 Green has lined up in the slot, he’s averaged 4.34 yards per route run, which is the best rate for receivers with at least 50 routes from the slot. Cleveland Browns: Over the last calendar year, Christian Kirksey has 44 stops, and Joe Schobert has 42, which respectively ranks second and third among linebackers in that span. Pittsburgh Steelers: When wide receiver Antonio Brown has lined up in the slot, he’s been targeted on 38.3% of his routes, which is the highest rate for receivers in the slot. Houston Texans: Despite missing significant time in 2016 and 2017, J.J. Watt has 483 career pressures, which is fourth-most since 2011. The only defenders ahead of him are Von Miller, Michael Bennett, and Carlos Dunlap, and each has at least 200 more pass-rushes than Watt. Indianapolis Colts: Quarterback Andrew Luck has 14 red zone touchdown passes this season, which leads the league. That is the most for a quarterback over the first six weeks of a season since 2014, when Andrew Luck also had 14 red zone touchdown passes. Jacksonville Jaguars: Running back T.J. Yeldon has been tackled for a loss on 3.0% of his carries, which is the lowest rate among backs this season. Tennessee Titans: Quarterback Marcus Mariota has had eight defenders miss tackles on his rushing attempts this season, which is the second most for a quarterback behind Cam Newton. Denver Broncos: Over the last two seasons, Todd Davis has five run stops when opponents have needed five yards or less for a touchdown. That is the most for all defensive players, regardless of position. 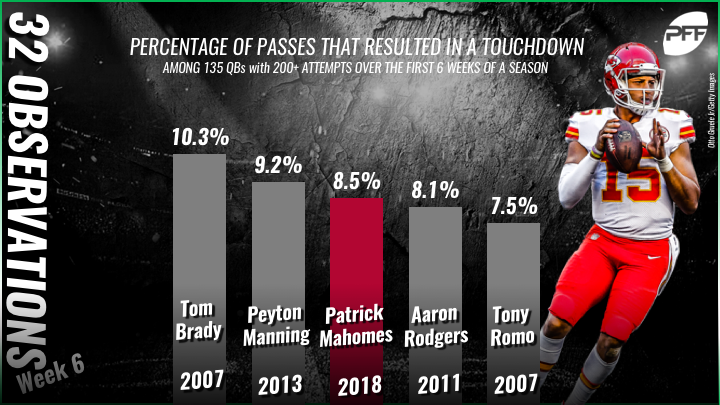 Kansas City Chiefs: Patrick Mahomes has thrown a touchdown on 8.5% of his passes. Over the last 12 years, the only quarterbacks with 200 or more attempts and a better touchdown rate after Week 6 are Tom Brady in 2007 and Peyton Manning in 2013. Los Angeles Chargers: Cornerback Casey Hayward is allowing 1.4 yards after the catch per reception allowed, which is the fewest for cornerbacks this season. Oakland Raiders: Over the last two seasons, center Rodney Hudson has allowed pressure on 0.6% of his pass blocks, which is twice as good as any other center. He has allowed five pressures in that span, while 21 centers have allowed 5 or more pressures in 2018 alone. Dallas Cowboys: Cornerback Byron Jones has nine stops on pass plays when lined up on the outside, which is the most for all cornerbacks in that situation. New York Giants: Safety Landon Collins has 16 stops on the season, which is tied for the most among all safeties. He has finished first in this category in each of the previous two seasons. Philadelphia Eagles: Since 2013, Fletcher Cox has 137 pressures on third downs, which is the most for interior defenders in that time span. Washington Redskins: QB Alex Smith has only had one of his passes dropped. With 171 pass attempts, that is a drop rate of 0.58% which is the best rate ever recorded over the first six games of a season. Chicago Bears: Cornerback Bryce Callahan has eight stops on pass plays when lining up in the slot, which is tied for the most for cornerbacks in that situation. Detroit Lions: Left tackle Taylor Decker has pass blocked on 53 third-down snaps, and has yet to allow a pressure on any of them. Green Bay Packers: Tight end Jimmy Graham has 27 catches with no drops this season. He is tied for the most catches this season without a drop. Minnesota Vikings: Linval Joseph has 33 run stops when lined up at nose tackle, which is the second most among defensive players. Only Damon Harrison has more, and he has eight more than the third-best nose tackle. Atlanta Falcons: Rookie running back Ito Smith has forced a missed tackle on 21.9% of his carries, which is the third-best rate behind Marshawn Lynch and Kareem Hunt. Carolina Panthers: When right tackle Taylor Moton has lined up at right tackle, he’s allowed pressure on just 2.55% of his pass blocks. That is the best rate for right tackles in that time span. 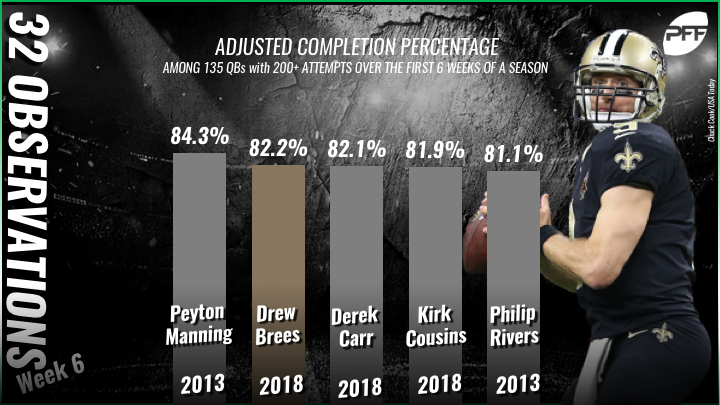 New Orleans Saints: Quarterback Drew Brees has an adjusted completion percentage of 84.1%. That is the best rate for a quarterback after Week 6 in the last five years. Tampa Bay Buccaneers: Over the last calendar year, Kwon Alexander has 46 stops, and Lavonte David has 41, which respectively ranks first and fourth among linebackers in that span. Arizona Cardinals: Since the start of the 2015 season, Patrick Peterson has been targeted on just 10.8% of his coverage snaps, which is the lowest rate among all cornerbacks. Los Angeles Rams: Jared Goff is averaging 10.1 yards per attempt when he’s not under pressure. If he finishes the season there, it would be tied for the best mark for a quarterback since 2006. San Francisco 49ers: Running back Matt Breida is averaging 3.76 yards before contact per attempt, which is 0.9 yards more than any other back with 50 or more carries. Seattle Seahawks: After allowing five pressures in Week 1, Duane Brown has allowed just four pressures in the last five games. His 2.7% pressure rate is third-best for left tackles since Week 2.